Feed Your Fiction Addiction: Feature & Follow Friday - Photobomb! So, I'm really lame and I had to look up what a photobomb is. But, after I read about it, I knew I had the perfect picture. 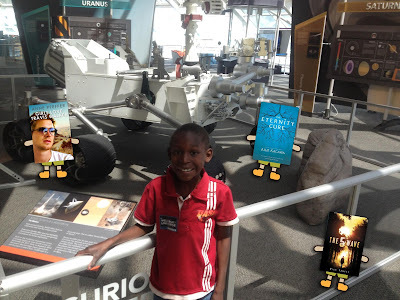 My son and I were at the museum and a couple of my favorite recent reads just jumped into the picture I was taking! Can you believe it? So weird. I don't really have an all-time favorite book, so I just chose a few of my favorite recent reads - Girls Love Travis Walker, The Eternity Cure and The 5th Wave. I hope you and your son had fun at the museum! Omg the hands and feet on the books are so fun!! Thanks for stopping by my blog. I am definitely following and I grabbed your button it is so cute. Love the novels hovering around your son! Adds a touch of otherworldliness!! I am now following via GF and BL. Haha I love their little legs! Such a cute and creative photo!!! New follower via GFC and FB! Thanks for stopping by my blog! Your photo is so cute! Great pic! I wish I knew how to do that with photos! :) Thanks for stopping by my blog. I'm an old GFC follower but I'm following via Bloglovin now as well. Happy Reading! OOh very nice!! These are things I wish I could do myself, but I am not talented enough with photoshop! Thanks for stopping by. Following you back via Bloglovin'. I love the books' little feet. Hihi, great pic. And very good misbehaved books, lol. Thanks for stopping by my FF. Old follower. Hey Nicole. Those are indeed sneaky books! ;) I also enjoyed The 5th Wave and The Eternity Cure looks very intriguing. Thanks for stopping by my blog. Following you back via Bloglovin'. Hi I'm following thru from Parajunkie's follow friday. Following you on Bloglovin & GFC! You can follow me back at "Literary Quill Promotions"
Love the pic! The hands and feet on the books are hilarious, and your son is such a cutie. I keep seeing 5th Wave around but haven't gotten to it quite yet! :) Thanks for the follow, I'm following you back. Thank you so much for stopping by Vicariously and commenting me last week. I just followed you via every way I could.